Winnie-the-Pooh is ‘The Bear for all Ages’, and now he’s more fun than ever before. Join in for some sticker book fun! 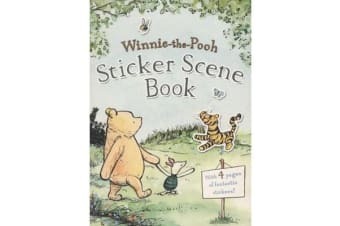 Combining the charm and humour of A.A. Milne’s classic books with the entertainment and educational value of a children’s activity book, Winnie the Pooh Sticker Scene Book is both engaging and interactive for children. Explore the Hundred Acre Wood and use the stickers of Winnie-the-Pooh, Piglet, Tigger and all their friends to retell A.A. Milne’s stories or to create brand new adventures!